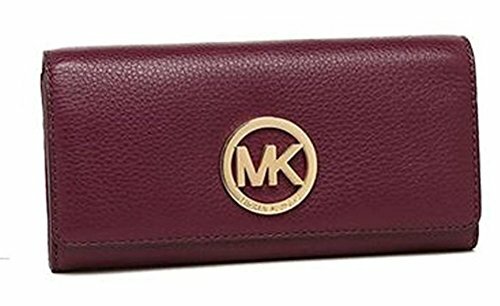 MICHAEL Michael Kors Fulton Leather Carryall Card Holder (Plum) | What Should I Say? The piece that belongs in every girl's handbag? One luxe card holder. This Fulton design combines the very best of elegance and utility for an accessory that keeps you feeling organized and looking chic. We crafted the classic silhouette in soft Venus leather for a sumptuous feel, and finished it with our oversized logo charm to glamorous effect. Measures 7.5 x 4.5 x 1"